EastWest Red Ribbon Treats ~ Philippine Freebies, Promos, Contests and MORE! 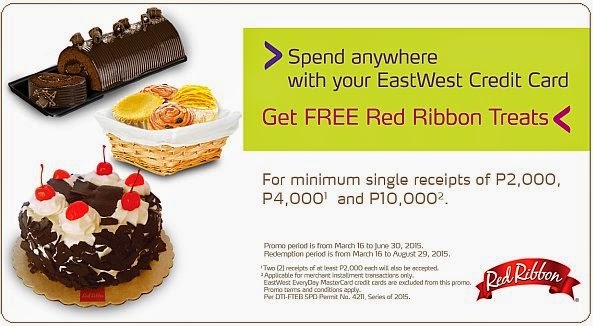 Now you can shop and satisfy your sweet tooth craving at the same time in EastWest's FREE Red Ribbon Treats promo. For every minimum single-receipt of at least P2,000, get your choice of 3 pcs Mamon (Butter, Mocha or Ube), 3 pcs Cinnamon Roll, or 3 pcs Ensaimada. A higher minimum or accumulated receipt worth P4,000 gives you a choice any Half Roll cake while a P10,000 minimum single-spend offers you any Junior Cake and 8 pcs Brownies or any Full Roll Cake and 8 pcs Yummy Cheese Rolls. Shop, swipe and enjoy redeeming up to a maximum of three (3) FREE Red Ribbon treats per card, per day, per outlet. Redemption is valid for dine-in and take-out only.